HDR vs. 4K: What's the Difference? When shopping for a TV, 4K and HDR are hyped as trending features to consider. Let's cut through the hype and learn what they really mean. 4K refers to resolution, which is stated in pixels. For TVs, the 4K standard is 3,840 x 2160 pixels. This means that a 4K TV displays 3,840 (which is approximately 4K) horizontal and 2,160 vertical pixels in a 1.78:1 aspect ratio (more commonly referred to as 16x9). The total number of pixels is 8,294,400 (approximately 8 megapixels). 4K resolution is 4 times the number of pixels (or twice the lines) as 1080p. Four 1080p images can fit in the space of one 4K resolution image. 4K (or any other stated TV resolution) remains constant regardless of screen size. However, the number of pixels per inch varies depending on the size of the screen. This means as TVs screen size grows, pixels are increased in size, and, or spaced farther apart in order to maintain the same resolution. 4K resolution may also be referred to as Ultra HD, UHD, 2160p, 4K x 2K, Ultra High Definition, 4K Ultra High Definition, Quad High Definition, Quad Resolution, Quad Full High Definition, QFHD, UD. Although 4K TVs display quadruple the number of pixels as 1080p, that difference may not be perceived on screen sizes smaller than 55-inches. In addition to TVs, 4K is featured in many home theater receivers, media streamers, Ultra HD Blu-ray Players, and Blu-ray Disc players that employ 4K upscaling. It is also available in some video projectors. 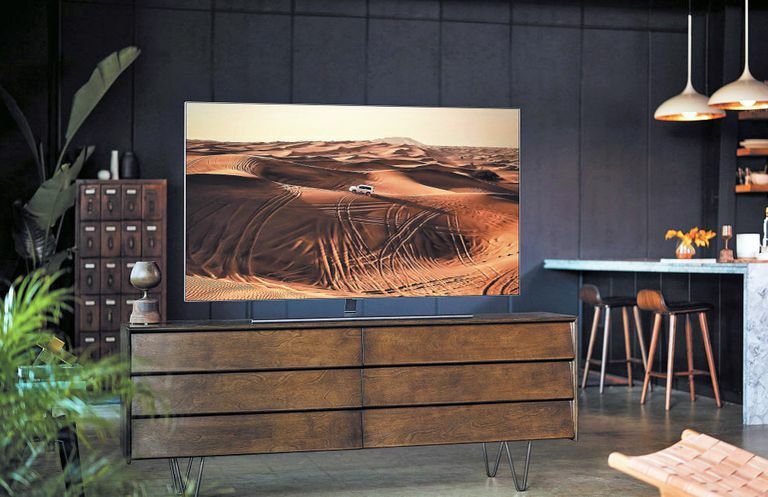 Although 4K TVs can upscale lower resolution images, for best results, you need to connect 4K compatible components, combined with physical or streaming content produced and supplied in 4K. 4K has not yet been implemented in over-the-air TV broadcasting in the U.S. beyond field testing. Consider the TV's motion processing features. Most 4K TVs are smart TVs. 4K TVs are available with or without HDR (discussed below). If shopping for a high-end set, check for the UltraHD Premium designation. HDR stands for High Dynamic Range, which is different than resolution. In a video, dynamic range represents the "distance" (contrast) between white and the black in an image. In most cases, that distance is fairly narrow and is referred to as SDR (Standard Dynamic Range). HDR is an expansion of the distance (contrast) between white and black in which bright whites can be captured and/or corrected so that they are more intense but don't overwhelm the rest of the image that would normally be due to overexposure. Dark areas can also be made deeper without the image suffering from underexposure. When high dynamic range images are filmed or captured, the information is used in post-production to "grade" the content so that the widest possible range of white to black is obtained. The images are also graded to produce more saturated and accurate color, smoother light and color shading, as well as revealing more detail in all parts of the image, including dark areas, that are normally not visible. Grading may be applied to each frame or scene, or as static reference points for an entire film or program. Once HDR encoding is complete, the content can be placed on a storage and/or delivery format (physical, streaming, or broadcast), and viewed on a compatible TV. When an HDR-enabled TV detects encoded content, bright whites should appear without blooming or washout, deep blacks displayed without muddiness or crushing, and hidden details revealed. For example, in a sunset scene, you should see the bright light of the Sun and the darker portions of the image with similar clarity, along with all the brightness levels in between. HDR Encoded Content: The main HDR formats in use are HDR10/10+, Dolby Vision, HLG, and Technicolor HDR. Content may be encoded with one or more formats. The brand/model of HDR-enabled TV determines what format(s) it is compatible with. If a TV can't detect a compatible HDR format, it will display the images without HDR benefits. SDR to HDR processing: In a similar way as TVs upscale a lower resolution video signal to match a TV's display resolution, an HDR TV with SDR-to-HDR upscaling can analyze the contrast and brightness information of an SDR signal and expand the contrast range so that approximates HDR quality. How well an HDR-enabled TV can display HDR depends on how much light the TV can put out. This is referred to as Peak Brightness and is measured in Nits. As an example, content encoded in the Dolby Vision HDR format may provide a 4,000 nit range between the blackest black and the whitest white. Few HDR TVs can output that much light, but a growing number will display up to 1,000 nits. Most HDR TVs will display less. OLED HDR TVs max out at about 750-800 and many lower-end LED/LCD HDR TVs may be as low as 500 Nits. However, OLED TVs can display absolute black, but LED/LCD TVs can't. When a TV detects an HDR signal, but can't emit enough light to display its full range, it will employ Tone Mapping to best match the dynamic range of the HDR content to the TV's own light output capability. HDR refers to expanded brightness and contrast range displayed on a TV screen. HDR is resolution agnostic. This means that application of HDR does not change the underlying video resolution. HDR is implemented on top of 4K, not in place of it. Due to its effect on brightness and contrast, HDR also enhances color. The visual difference between SDR and HDR can be seen on any screen size. However, the HDR effect may look different from TV to TV due to variations in light output capability. Not all HDR TVs feature SDR-to-HDR processing. When shopping for a TV with HDR capability, consider TVs compatible with the HDR10/10+, Dolby Vision, and HLG formats, as well as the TV's peak brightness capability. Whether shopping for a standard 4K TV or a 4K TV with HDR, keep the following in mind. Pixels are the foundation from which 4K resolution is established and HDR is one way to make pixels look their best. HDR has a bigger visual impact than 4K. Since 4K TVs are the majority of TVs available and sold, content creators and distributors, along with TV makers have prioritized the application of HDR to 4K Ultra HD TVs over 1080p or 720p TVs. In the U.S. all HDR TVs are 4K TVs, but not all 4K TVs are HDR TVs. For best viewing results, consider a TV that incorporates both 4K and HDR. In Europe, Sony offers a select number of 1080p TV models (WF66, RF45, WE75, WE66, WE61, RE45) that are compatible for 1080p HDR gaming and streaming content that may include HDR encoding. Forthcoming 8K TVs will also incorporate HDR.